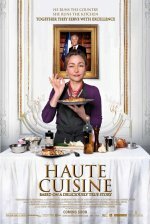 Hortense Laborie (Catherine Frot) becomes the private chef for French president (Jean D'Ormesson) when he falls in love with her cooking. Haute Cuisine release date was Friday, September 20, 2013. This was a Limited in theaters release. Based on the extraordinary true story of President Francois Mitterand's private cook.